I believe this edition of Mega Doctor News is a very special issue. 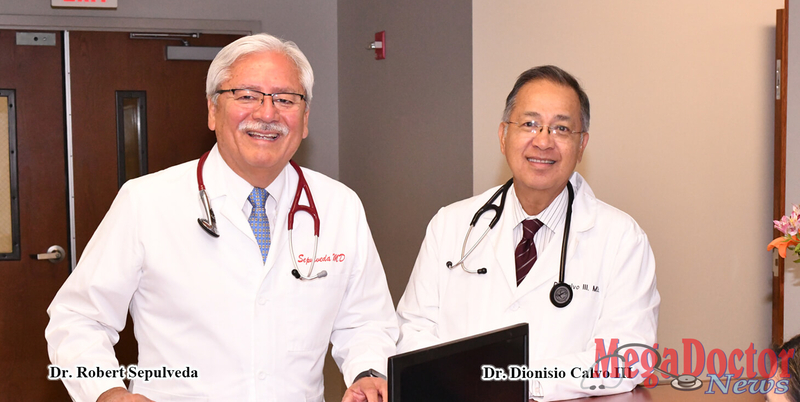 I had the pleasure of meeting and working on it with two of the finest physicians of the Rio Grande Valley, Dr. Robert Sepulveda and Dr. Dionisio Calvo, III, both internal medicine physicians from Weslaco and with Knapp Medical Center. During the month of April 2018, with the help of a dedicated committee, both doctors celebrated the 26th Annual Rio Grande Valley Medical Education Conference & Exposition. The conference took place at the Embassy Suites Convention Center in McAllen for the first time in 24 years. The purpose of this educational symposium is an opportunity for the continuing education of physicians. This is a regulatory requirement that they have to follow. But the point here is that the two physicians and their committee did a great job selecting the finest of faculty physicians. The subjects covered cancer prevention, treatment of Type 2 diabetes, and wellness among the many topics. From Mega Doctor News a BIG Thank You to Karen Reichow, M.D. ; Patricia Sulak, M.D. ; Carlos Morales, M.D. ; Adolfo Kaplan, M.D. ; Habib Ghaddar, M.D. ; William Craig, M.D. ; Wondwossen Tekle, M.D. ; Curtis Triplitt, Pharm. D.; Arauco Brown, M.D. ; Victoria Parada, M.D. ; Luis Gaitan, M.D. ; Ross Ungerleider, M.D. ; Jamie Ungerleider, Ph.D., and Juan Garza, M.D., and all-conference faculty. In this issue, you will find articles on most of the physicians. Next month we will publish more of the stories; there just is not enough space to do it all in one edition. May is Mental Health Month: When we talk about health, we can’t just focus on heart health, or liver health, or brain health, and not whole health. You have to see the whole person and make use of the tools and resources that benefit both minds and bodies together. That’s why this year, our May is Mental Health Month theme is Fitness #4Mind4Body. Rigel Piñón, a UTRGV Master of Science in Clinical Rehabilitation Counseling graduate student, is the recipient of not just one national award, but three national awards in one school year. It is quite the achievement; she can scratch that off her bucket list. News from UTRGV SOM: The University of Texas Rio Grande Valley School of Medicine hosted a grand opening of its UT Health RGV Pediatric Specialty office on April 25, in Edinburg. This is good news; read more in this issue. Great News from UTRGV: The University of Texas Rio Grande Valley has received approval from the Texas Higher Education Coordinating Board to establish a new degree program for a Doctor of Philosophy (Ph.D.) degree in clinical psychology. Welcome: A new urologist in Weslaco has a name that is unique – Dr. Shamoon Doctor – he can also boast of 40 years of experience in treating patients with various urology conditions. There is more in this issue; I know you’ll love it!